Tirumala Sri Venkateswara Temple is a famous Vedic temple in the hill town of Tirumala, near Tirupati in Chittoor district of Andhra Pradesh, India. 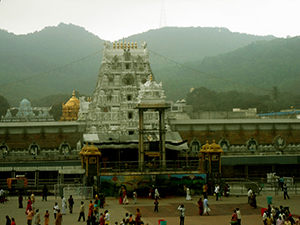 The presiding deity of the temple is Lord Venkateswara , an incarnation of lord Vishnu. Venkateswara is known by other names: Balaji,Govinda and Srinivasa. The temple is visited by millions of pilgrims annually. On special occasions and festivals, like the Brahmotsavam, the number of pilgrims shoots up to five million, making it the most-visited holy place in the world. The temple is also visited by a a large no of serving and retired army personnel and their families. A need was felt to create a facility at Tirumala exclusively for them to stay in a neat and comfortable environment. The idea of constructing Tirumala Tirupati Sainik Niwas (TTSN) was thus conceived in Jul 2002. With concerted efforts 6600 Sq ft of land was taken on lease from Tirumala Tirupati Devasthanams (TTD). The construction of TTSN started in 2002 and was completed in May 2010. 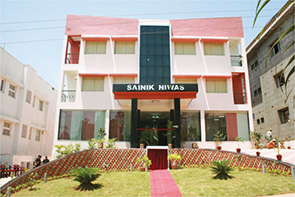 The TTSN has been constructed close to the temple premises and offers a comfortable stay at very reasonable rates. Please Ensure that you Deposit the Booking amount within 36 Hours of booking else your booking will be cancelled. Please conserve Electricity and Water during you Stay at Sainik Niwas and help us to serve you better. Maruit Van is available from 1000hr to 1600hr. The rates are for occupancy by two members only. Additional occupants are permitted with extra charges as per SOP.